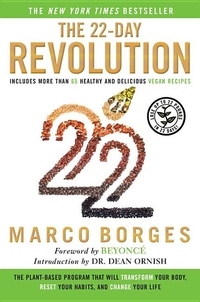 A groundbreaking vegan program designed to transform your mental, emotional, and physical health in just 22 days--includes a Foreword by Beyoncé, and an Introduction by Dr. Dean Ornish. As one of today's most sought-after health experts, exercise physiologist Marco Borges has spent years helping his exclusive list of high-profile clients permanently change their lives and bodies through his innovative methods. Celebrities from Beyoncé, Jay-Z, Jennifer Lopez, and Pharrell Williams, to Gloria Estefan and Shakira have all turned to him for his expertise. Beyoncé is such an avid supporter that she's partnered with Borges to launch 22 Days Nutrition, his plant-based home delivery meal service. Now, for the first time, Borges unveils his coveted and revolutionary manifesto, featuring the comprehensive fundamentals of starting a plant-based diet. Inside, you'll find motivating strategies, benefits and tips for staying the course, delicious recipes, and a detailed 22-day meal plan. With this program, you will lead a healthier, more energetic, and more productive life--helping you to live the life you want, not just the one you have.